Be the first to share your favorite memory, photo or story of Micheal. This memorial page is dedicated for family, friends and future generations to celebrate the life of their loved one. 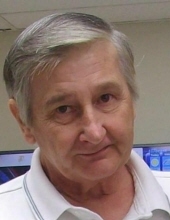 Micheal Eugene “Mike” Freeman, 67, husband of Barbara (Campbell) Freeman of 70 Village Street, passed away Sunday, November 18, 2018 in the Augusta Health in Fishersville. Mr. Freeman was born on February 25, 1951 in Mooresville, North Carolina, a son of the late Harry Henerson and Helen Coleen (Peacock) Freeman. Mike retired from Burris Logistics where he was employed as a forklift operator. He enjoyed watching and playing baseball, spending time with his family, and had a wonderful sense of humor. In addition to his parents, Mr. Freeman was preceded in death by an infant daughter, Tracy Freeman; two brothers, Glen Freeman and Butch Freeman; and a sister, Melba Freeman. Surviving in addition to his wife of twenty-eight years are two sons, Michael O. Freeman and his wife Margaret of Mooresville, North Carolina and Cory S. Bowden, Sr. of Staunton; five grandchildren, Michael D. Freeman, Marshall D. Freeman, Krista M. Freeman, C. J. Bowden, and Summer B. Bowden; and a number of nieces and nephews. A Graveside service will be conducted 2:00 p.m. Tuesday, November 20, 2018 in the Little River Church of the Brethren Cemetery by Mrs. Claudette Wilcher. The family will receive following the service. To send flowers or a remembrance gift to the family of Micheal Eugene "Mike" Freeman, please visit our Tribute Store. "Email Address" would like to share the life celebration of Micheal Eugene "Mike" Freeman. Click on the "link" to go to share a favorite memory or leave a condolence message for the family.